WASHINGTON, D.C. (The Nil Admirari) - A survey of 100,000 Americans found 91% "strongly supported" body cameras on all elected officials. A vast majority of Americans supported cameras because they served as a deterrent to crime by collecting evidence automatically, and protected elected officials from false accusations of corruption and other crimes. 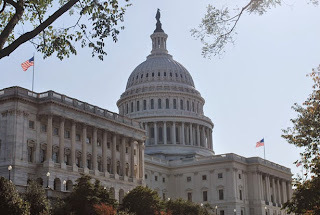 "It is clear most Americans want to keep their elected officials safe and accountable during such a dangerous time when government corruption is at record highs," said senior researcher Dr. Martin Lang. When Americans were asked specifically about members of Congress 97% "strongly supported" cameras on elected officials at the Capitol Building compared to 91% on the president and 96% on the Supreme Court justices (who are not elected, but are appointed by the senate). The place a majority of Americans are most concerned about crime (above). "Americans are most concerned about the level of crime in Washington. They want to know their elected officials are serving them professionally and keep both citizens and elected officials safe," said Lang. The Supreme Court was the only government body to respond to our request for comment. "If we won't allow cameras in our courtroom we sure as hell won't allow them in our robes," stated the justices.